God used the burning bush to draw Moses aside, to hear God’s voice and to discover how God wanted to use him. What Moses heard was God’s plan, not Moses’ plan. God does not come to us and ask, “What is it you would like to do with your life? Just let me know and I will back you all the way.” It is God’s plan that we must follow. As the “I Am” He is the God of the past, the God of the future, and the God of today. He never says, “What I once have been I can no longer be.” He never says, “What I will be in the future I cannot be today.” God is always in the “eternal now.” All that He was He always will be. When God says “I Am” He is saying that He is all-in-all. He is your provider and He is your provision, whatever your need may be. In trouble, He is your peace; in lack, He is your sufficiency; in changing circumstances, He is your contentment; in difficulty, He is your joy; in weakness, He is your strength; in battle, He is your victory; in impossibilities, He is your miracle worker. 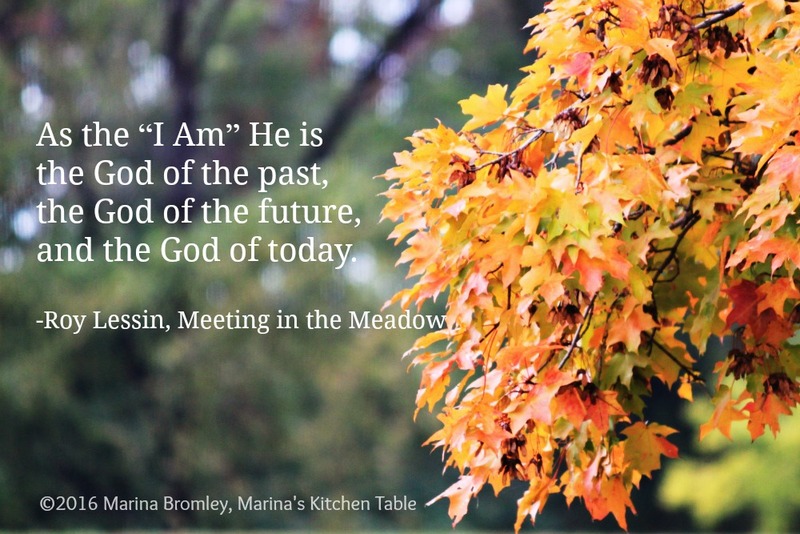 Meeting in the Meadow; What's It All About?